Have you ever had the “Crispy Coconut Rolls” they sell at Costco? They’re made in Thailand by a company called Tropical Fields and they’re delicious. Turns out, they’re a popular snack in Thailand called tong muan and they’re really easy to make. All you need is a pizzelle maker, six ingredients, and a chopstick to roll them up with. These crispy Thai cookies, called tong muan, go really well with coffee or tea. Gluten-free and only six ingredients! 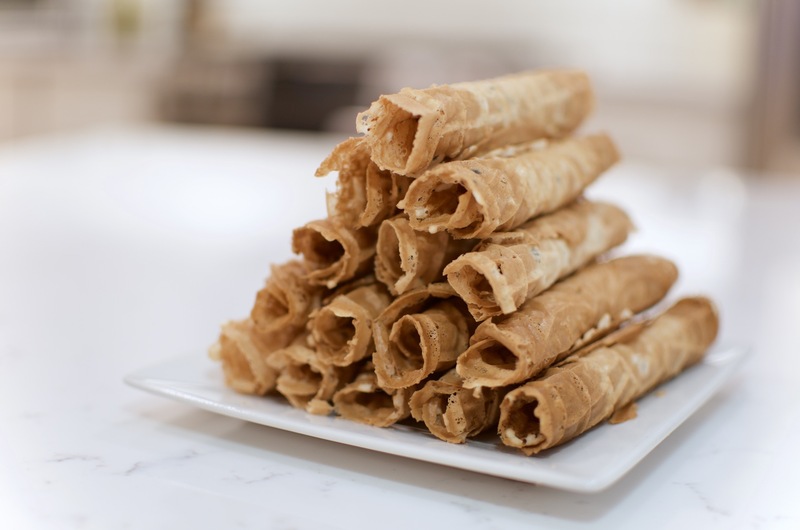 Preheat your pizzelle maker, ice cream cone maker, or krumkake maker. In a large bowl, stir together palm sugar and a few spoonfuls of coconut milk. If the sugar is too hard to stir, microwave the mixture in 15-second intervals to soften it up. Once the sugar is softened and beginning to dissolve, add the rest of the coconut milk and whisk to combine. Add the tapioca flour, egg, salt, and sesame seeds, and whisk to combine. Drop small spoonfuls of batter onto the pizzelle press. Close and bake for 18 seconds. Quickly remove each cookie and roll into a cylinder using a chopstick. Slide the chopstick out and place the cookie on a wire rack to harden and cool. Alternatively, fold each cookie in half, then in half again, to make a fan shape. Repeat until you run out of batter! Instead of a pizzelle maker, you can also use a krumkake maker or a waffle cone maker if you happen to have one. This recipe makes a lot of cookies, but it works out nicely since you can use whole packages of the ingredients and a whole egg. They store well at room temperature, but you can of course scale the recipe down. You can stick with the whole egg if you scale it down, or scramble the egg and use only some of it. I find that this ratio of egg to flour produces a lighter, crispier cookie, but many recipes use a whole egg with half the amount of flour. Try to find “wet” palm sugar, sometimes marketed as “syrup” or “paste”—it’s sold in jars and is about the same consistency as natural peanut butter. Palm sugar has a delicious caramel flavor, and it’s worth searching for the wet version, which is much easier to work with. If you can’t find it, regular palm sugar or even light brown sugar will do, but you’ll need to reduce the quantity and add some water. (According to the nutrition facts, the wet palm sugar is about 26% water.) Sweeten to taste with about 330 grams of your alternative sugar, and up to 120 grams (about half a cup) of water. Use only as much water as you need to soften the sugar, and reserve the rest to thin the batter to a consistency you like. It shouldn’t be too hard to find tapioca starch—if you don’t have an Asian market nearby, you’ll probably find it with the Bob’s Red Mill products. Check the gluten-free or organic sections. But do try the Asian market first—it’s guaranteed to be much cheaper! My favorite variety of coconut milk for this recipe is Chaokoh’s “coconut cream” in the jaunty green can. Any other canned variety will work, too. If there’s a can labeled “cream,” try that over one labeled “milk”—these seem to have a bit more coconut flavor and are very rich. Perfect for desserts. Just don’t use coconut milk that’s sold as a beverage—that stuff is tasty, but too thin and not flavorful enough to use here. Here in the DC metro area, I get most of my international ingredients from the Bestway supermarket chain, and they’ve got everything listed above. Wegmans usually has it all, too, including the soft palm sugar. If you’re up by Falls Church, check out the market behind Duangrat’s Restaurant. They’ve got the soft palm sugar and tons of other fun stuff. That said: don’t sweat the ingredients too much. These cookies are super forgiving, and if you can’t find exactly the same ingredients I use above, you can still make a great cookie. I tried thick batter, thin batter, more flour, less flour, coconut “milk,” coconut “cream,” and so on—and they all came out pretty decent. Basically, these things are coconut and sugar, with just enough starch and egg to hold it all together. It’s hard to go wrong. My first step in this recipe, as it is with all things Thai, was to check Hot Thai Kitchen and SheSimmers for a recipe. No luck in either of those places, and not much on Google, but I found tons of recipes on YouTube. This one from “Fambrouwer ThaisKoken” looked the best, so I gave it a shot. Pretty good, and very similar to what I eventually settled on. Looking at the rest of the recipes, there was a ton of variation. Some used all tapioca flour (like the ones at Costco do), some used all rice flour, and some used a mix of tapioca, rice, and wheat. After some helpful advice from Pailin herself in the Hot Thai Kitchen Patreon community, I decided to start experimenting. To keep things simple, I decided to stick to 100% tapioca flour. The thinner the batter, the more delicate and crisper the cookie. When you close the pizzelle press, the wetter batters let out a bust of steam, and you can hear the batter rapidly start boiling. This forms bubbles, which form little holes that are then set by the heat of the press. Wetter batters also tend to produce softer, lighter cookies. The commercial makers appear to use very wet batters. Take a look at the tong muan sold at ImportFood—44% coconut milk by weight. That’s a lot, and similar to the Tropical Fields cookies, which list 50% coconut milk by weight. By comparison, my recipe above is about 29%. Cooked only in a press, a batter with 44% or 50% produces a cookie that’s more chewy than crispy. The Tropical Fields bag says the cookies are “rolled then baked,” which I imagine means they’re taking the chewy cookies off the press and then crisping them up in an oven. I played around with this a bit, but it was kind of a pain and I never found an iteration that was worth the effort. Many recipes which use tapioca flour call for resting the batter before using it, but I found this to do more harm than good. The rested batter seems to hold on to more water when baking, which makes for a denser, less lacy cookie. It’s difficult to get the ratio of egg to flour perfect unless you’re making a huge quantity or are willing to throw some egg away. (That’s why my recipe makes 100 cookies!) I may have gone too far in the opposite direction—I’m using even less egg than the commercial producers, I think—but I was so close to using a whole can of coconut milk that I figured it was better to fudge the numbers than call for 85% of a can. I’m curious to try a vegan egg replacement like aquafaba, or even omitting it altogether, but after five batches of these things I think my family could use a break from coconut rolls. One option when you’re scaling the recipe down is to try reducing the coconut milk in a saucepan until it reaches the volume you need. This makes a slightly richer cookie, and works especially well if you’re using hard palm sugar, since it will dissolve easily in the hot coconut milk. If you want to cut the recipe in half, you can put the coconut milk and sugar in a pan, then weigh the whole thing and write down the total weight. Then periodically weigh it—pan and all, with a trivet on top of the scale to protect it—and reduce it until it loses, say, 200 grams of water. The amount of sesame seeds you use has a pretty big impact on the overall flavor of the cookies. Some recipes called for fully twice the amount I use here, and that produces a confection that’s very rich and nutty, but not quite the cookie that my American palate expects. If that appeals to you, though, go ahead and throw in an extra tablespoon! One final point: as I mentioned above, these things are super flexible, and you really can’t go wrong. It’s a fun project, and a great excuse to buy a new kitchen gadget! Enjoy!